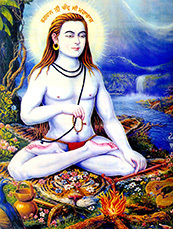 Baba Sri Chand is known as the world’s greatest Yogi. He is said to have walked on the planet for 151 years and never aged. He attained what the yogic writings describe as, “Kanchan Kaya,” the golden body. Born on September 8, 1494 in the sacred land of Sultanpur Lodhi in India, he was the elder son of Guru Nanak and Mata Sulakhani. He was initiated at the age of seven, by Guru Nanak who taught him the yogic science of Charan Jaap and Mantra Jaap. Under the instructions of his father, he also studied the Sanskrit texts and the Khat Darshan. When Guru Nanak returned from his final Udasi (travels), he presented his Udasi robe to Baba Sri Chand. Continuing the tradition of Udasis, Baba Sri Chand went as far as Afghanistan, Tibet, Assam, and all over India to continue spreading the message of his father. There still exists a Dhuna, the sacred fire of Baba Sri Chand in Shor Bazar Complex, Kabul, Afghanistan, where the local Sikhs have built a Gurdwara. Guru Nanak himself crowned Baba Sri Chand as a Yogi, to take care of the Yogis, who were bothering the householders with their occult powers. While Gurugadee was passed to Guru Angad, Udasigadee was bestowed upon Baba Sri Chand. He wholeheartedly accepted the responsibility given to him by his father and Guru to unite the various Yogic schools of India known as Sadhu Samaj. with an intention of testing him. And began to sweep it again and again with his long beard. Baba Sri Chand in return bowed at the feet of Guru Ram Das. Under Baba Sri Chand’s guidance, the heads of all the schools of yoga (which he had united under the instructions of Guru Nanak) also came and bowed to Guru Ram Das. This sealed the future. From that moment forward, the lineage of the royal throne of Raj Yoga would come through the subtle and radiant bodies of Guru Ram Das. Thus, Kundalini Yoga as Raj Yoga was brought through the House of Guru Ram Das, and got ‘colored’ with the Sikh consciousness. Baba Sri Chand, who is known as the protector of innocent seekers, left behind many yogic technologies for us. One such gem is the mantra, Adh Such, Jugad Such, Hai Bhay Such, Nanak Hosi Bhay Such. The mantra was composed on the request of Guru Arjun, the 5th Guru, when he came to visit Baba Sri Chand at Baath Sahib. Once the emperor of India, Jahangir, enquired from his spiritual teacher, Sain Mian Mir, who was also the head of the Sufi Order of Qadiris, “Who is the King of all the Darveshes today?" The Sufi master replied, “The elder son of Guru Nanak is the king of all the Darveshes." Such was the legacy of this blue bodied Yogi who was revered by Muslims, Sufis, Lamas, Hindus, Yogic Sects, ascetics, and householders alike. To further explore the legacy of Baba Sri Chand and the yogic history come and join fellow seekers in November 2014 in the sacred land of mother India, for a five day Yoga retreat entitled, Baba Sri Chand Retreat & Kundalini Yatra. All rights reserved. No part of this article may be reproduced without the permission of Yogi Amandeep Singh. 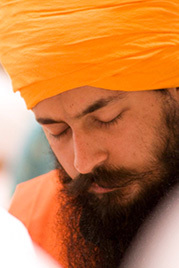 Amandeep Singh having completed his B.Sc Hons in Information System and Software Engineering from Oxford Brookes University, United Kingdom gave up his job to search for inner peace. He travelled to India and had the blessings to study from many teachers from the different Yogic traditions primarily from the Udasi Sikh tradition of Baba Sri Chand and the Nirmala Sikh Tradition of Guru Gobind Singh. This also led him to pursue his studies in a different field. He then did his MA in Comparative Studies in World Religions along M.Sc in Counselling from University of South Australia. He is well trained in Family, Youth, Prison and Transpersonal Counselling. Amandeep Singh is also a scholar with Kundalini Research Institute of USA, a certified Kundalini Yoga Teacher (as taught by Yogi Bhajan) and KRI Professional Teacher Trainer. His sessions and classes guide participants through an experience of physical and psychological release. He brings great depth, accuracy, joy and spontaneity to his teaching of Kundalini Yoga. He combines time tested psycho-spiritual techniques from many ancient wisdom traditions with the modern developments in the fields of emotional and psychological transformation. His workshops are very unique and highly effective in dealing with mental illness such as depression, anxiety and emotional traumas. He have released a number of New- Age CDs, on guided meditations and sound therapy which have helped many in self transformation and personal growth. He is also a healer and teacher of eastern spirituality and a regular speaker on international stages and Televisions with topics such as Healing, Non-duality (Advait), Mysticism, Zen, Self- growth, Mindfulness, Yoga, Meditation and Self- realization. This entry was posted in Invincible Music Blog, Yogi Amandeep Singh. Bookmark the permalink. Hello there, You’ve performed an incredible job. I’ll definitely digg it and personally recommend to my friends. I’m sure they’ll be benefited from this web site. This is a treasure! Thank you!